You heard me right, burlap! 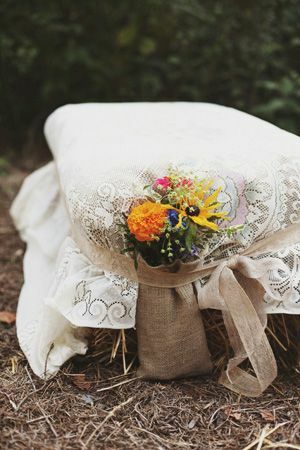 Traditionally thought of as a sack for rice or potatoes, burlap has become a wedding decoration staple, especially for an outdoor country wedding. It works beautifully as a table runner, as hay bale seat covers, wrapped around the bride's bouquet stems, and many other decoration possibilities. Burlap and lace is one of my favorite combinations, adding a bit of romance and charm. Burlap can be purchased for less than $4 a yard from craft or fabric stores, but even cheaper if you get creative and find it used or on clearance. 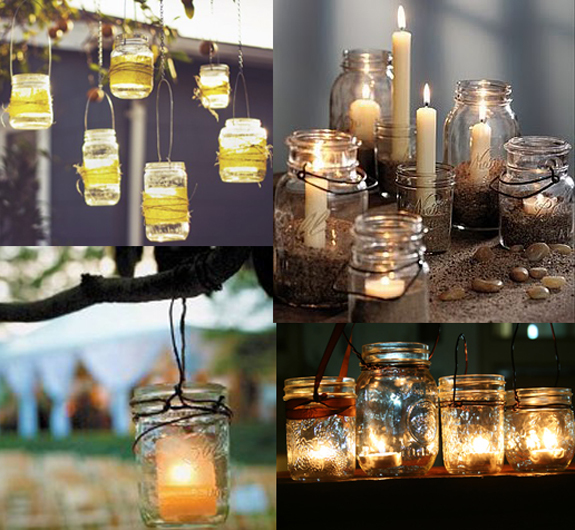 Mason jars make for charming vases, candle holders, wedding favors, and hanging lanterns. They can be purchased most commonly in clear, teal, blue, and green, but they can be decorated to your liking with things like lace, ribbon, or burlap. Turning your mason jars into candle holders is easy, filling it with things like sand, salt, acorns, rocks, or anything else that matches your wedding theme. They can also be used as hanging lanterns with the simple use of wire and twine. As a wedding favor, simply fill it with a recipe, such as layered ingredients for your favorite cookie recipe, or perhaps even a colorful bath salt. Depending on the size and type, mason jars can be purchased for less than $1-2 each. Use lots and lots of candles! Lighting plays a big role in the overall feel of your wedding, and candles are the cheapest and most effective way to create ambiance. Tea lights are especially cheap and work perfectly surrounding your reception table centerpieces. You can even get crafty and make your own candles. Get inspired with fabric! Go to your local fabric store and search through their clearance sections. 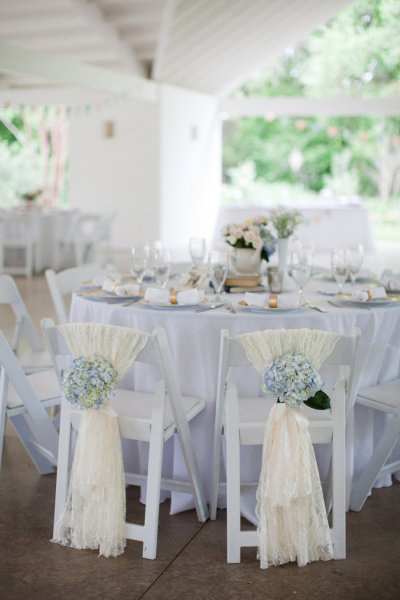 You can use fabric to create swags for a soft, luxurious backdrop. Or, you can create a tent ceiling to hide plain architecture, wrap the fabric around the back of the bridal party's chairs and create hanging bows, or use fabric to make a beautiful walkway down the aisle. Sheer fabrics such as tulle or organza work best. Let nature do your decorating! Depending on the season of your wedding, you can even use things from your own backyard, such as pine cones, evergreens, sticks, wheat, acorns, or rocks. There are stunning ways to use these items for a fall or winter wedding. Also, Instead of spending big bucks at your florist, consider using wildflowers - they are perfect placed in mason jars. Try to choose a venue that has free natural beauty, such as a botanical garden, lake, or vineyard. This way you can keep your wedding decorations minimal. Or, better yet, have it at home if you have the right setting and space to accommodate everyone. No matter your budget, with a little bit of creativity and research, you can have an impressive and enjoyable wedding day without being lavish or over the top.